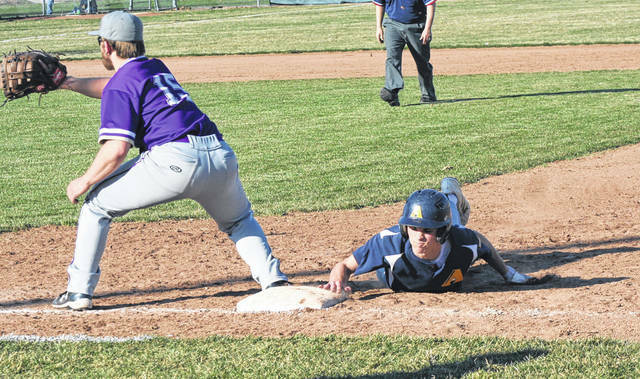 Archbold’s Brandon Taylor slides back into first base to avoid being picked off Monday versus Bryan in the NWOAL baseball opener. The Blue Streaks held on for a 5-3 win over the Golden Bears. Archbold pitcher Rigo Ramos pitches against Bryan Monday at Memorial Park. He went six strong innings, striking out 14 batters en route to picking up the win. 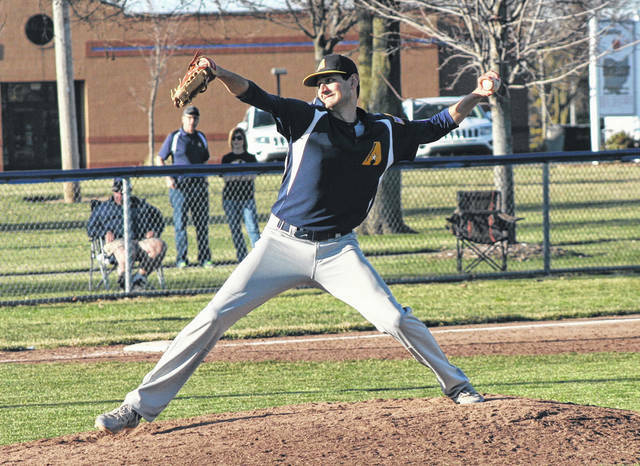 Archbold got six strong innings from senior pitcher Rigo Ramos and when he tired in the seventh, Aiden Warncke finished it off, leading the Blue Streaks to a 5-3 home win over Bryan to begin the Northwest Ohio Athletic League baseball season Monday. The Streaks helped themselves in their final two innings by extending the lead. Base hits by Mitch Grosjean and Cory Erbskorn, plus a Travis Ziegler walk helped them load the bases in the bottom of the fifth. Drake Mohring made it 4-1 when he reached on an infield single, scoring Grosjean. Then, Ramos wiggled out of a bases loaded jam in the next half inning. Already with two outs recorded, Bryan’s Zach Dye was caught staring at strike three to end the threat. An error allowed Kade Kern to reach, then Grosjean’s double to right field and Erbskorn’s ground out brought home Kern for a 5-1 Blue Streak lead heading into the top of the seventh. Roebuck reached with a walk, Noah Tressler by an Archbold drop in right field, and Nate Miller was hit by a pitch to load the bases with Golden Bears. This finally forced Ramos out of the game in favor of Warncke. Warncke drew three straight ground ball outs to second base – two of which scored Bryan runs – but the final one off the bat of Conner Lemons ended the game. Archbold, now 1-0 in the league, could now be looked upon as NWOAL favorite after knocking off the defending champs. However, their coach made it clear after the game he wants his team to remain grounded. Both teams held leads in the first inning, beginning with Bryan who got on the board on Lemons’ sac fly which plated Brooks Brown. Archbold answered with a pair in the bottom of the frame. Kern tied it with an RBI double to score Jeron Williams, then Erbskorn’s triple plated Kern to give the Streaks a 2-1 lead. They added another in the third on a two-out walk by Erbskorn, followed by Holden Galvan’s double to center, bringing around Erbskorn from first. Ramos allowed just one hit and three runs while striking out 14 Bryan hitters in getting the win. Roebuck struck out nine in 4 1/3 innings, but was charged with the loss for the Bears. Erbskorn paced the Blue Streak offense with two hits in three at-bats, driving in two runs. Brown had the lone hit for Bryan. Archbold next welcomes Swanton (0-1 NWOAL) for another league battle Thursday.